While Denver is Colorado’s government capitol, Colorado Springs is the state’s military capitol. 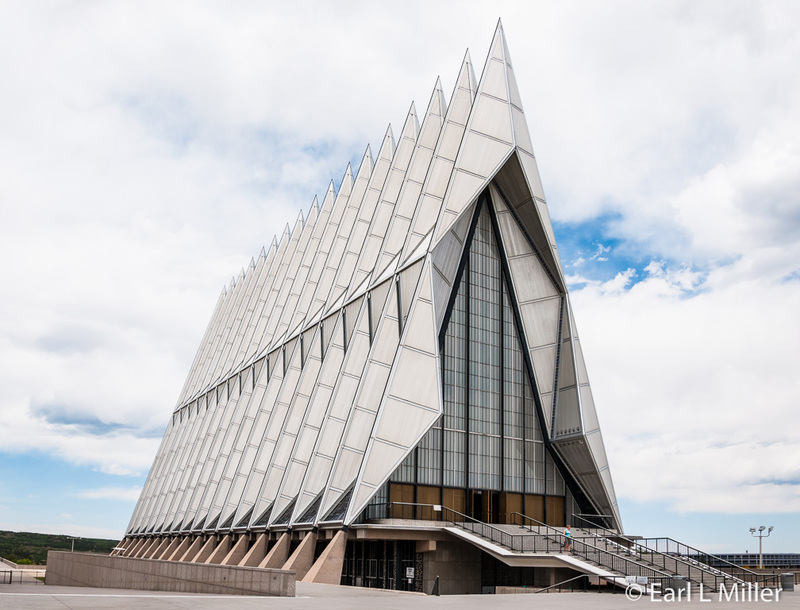 Visitors can tour the city’s Air Force Academy, visit the Fort Carson 4th Infantry Division Museum, or make arrangements to see the Peterson Air & Space Museum at Peterson Air Force Base. All are definitely worth some of your time. To tour the Air Force Academy, it’s mandatory to enter through the campus’s north gate. Anyone visiting needs a photo ID. Don’t be surprised if they ask you to open the trunk of your car. You’ll pass a large mounted B-52 bomber. The academy’s web site describes this bomber as the backbone of America’s manned bomber group for more than 50 years. Make your first stop the two overlooks where you can read signboards on such topics as the cadets’ academics and recreation. From there, you can see the entire campus - particularly the athletic fields. It’s also an outstanding place to take a panorama shot of the Academy. Head to the Barry Goldwater Visitor Center, constructed in 1986, for an overview of the academy’s history and cadet life. It contains exhibits, a theater, a Subway restaurant, and an extensive gift shop. At the theater, you can view a 14-minute film, shown every half hour throughout the day, titled “A Year in the Blue.” It takes you from the time a recruit enters the academy through graduation. You’ll learn that cadets receive six weeks of basic training when they first arrive in June. At the end of their training, they receive shoulder boards indicating that they are now cadets. In their sophomore year, they complete combat survival with many participating in parachuting. Juniors assume various leadership roles and work on teamwork while seniors lead their wings. They complete preparations to be air force officers. Near the theater, note the academy’s time line. In April 1954, President Eisenhower signed a bill to create the academy. More than 580 sites were proposed with the three finalists: Colorado Springs; Alton, Illinois; and Lake Geneva, Wisconsin. The main concern about Colorado Springs was how mountains or wind currents would affect flight training. Those concerns absolved when Lindbergh flew over the site in 1954 and announced it fit for flying. In June 1954, Secretary of the Armed Forces, Harold E. Talbott, announced Colorado Springs as the permanent site. The academy’s first class was sworn in at Lowry Air Force Base in Denver. There they adopted the honor code, the falcon as their mascot, and a permanent uniform. In August 1958, the entire cadet wing marched through the academy’s North Gate to their new home. In 1976, women were admitted to the Academy. They now comprise about 20% of the Cadet wing. One signboard is about the architecture found on campus. Erection of the buildings started in 1955. They used a lot of aluminum in the exteriors as that material suggested the skins of aircraft and spacecraft. Another lists the school’s superintendents. A map display indicates, with pins, the hometowns of the cadets. A mockup of a cadet room is also present. The rest of the exhibits concentrate on the academy’s four “pillars of excellence.” These relate to the four areas of cadet training: academics, athletics, character development, and military training. About 4400 cadets attend the academy which offers over 400 courses in science, engineering, humanities, and social sciences. Cadets must also take military and athletic courses. The school offers a choice of 31 majors. Cadets graduate as second lieutenants with a Bachelor of Science degree. A wide choice of recreation is offered from participating in bands and cadet chorales to being on the Sabre drill team. Athletics is stressed through intercollegiate and intramural programs. The visitor center is open daily from 9:00 a.m. to 5:00 p.m., free of charge to the public. Large bags or backpacks are prohibited. You can hike the 1/3 mile nature center from the visitor center to the chapel. However, it is hilly. We found it much easier to park at Arnold Hall as the terrain is even. 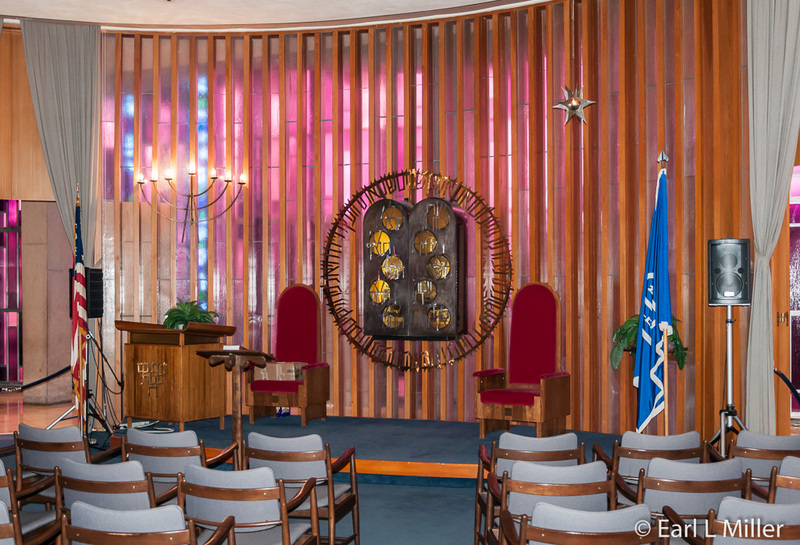 The Air Force Academy Chapel contains a separate chapel for Protestant, Catholic, Jewish, and Buddhist religions plus two all-faiths worship rooms. The Protestant Chapel on the top level dominates with the remaining ones below that. 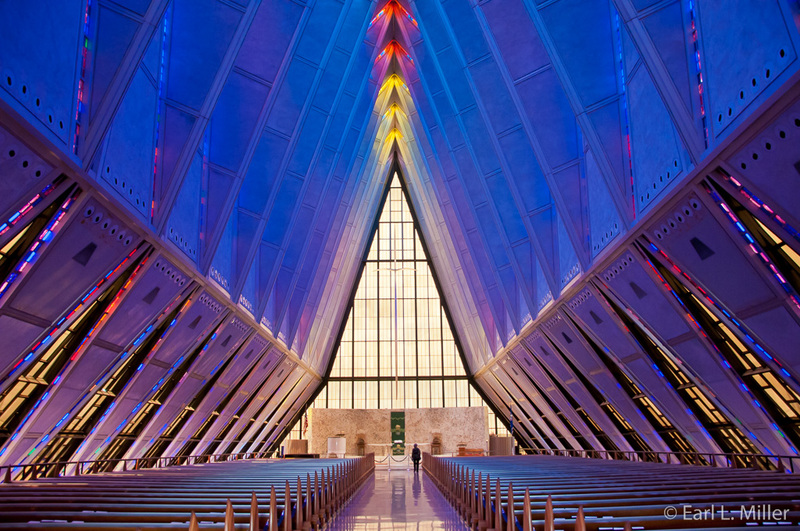 The building is an aluminum, glass and steel structure featuring 17 spires. The number of the spires doesn’t signify anything. Actually, more spires were planned, but they were reduced because of costs. 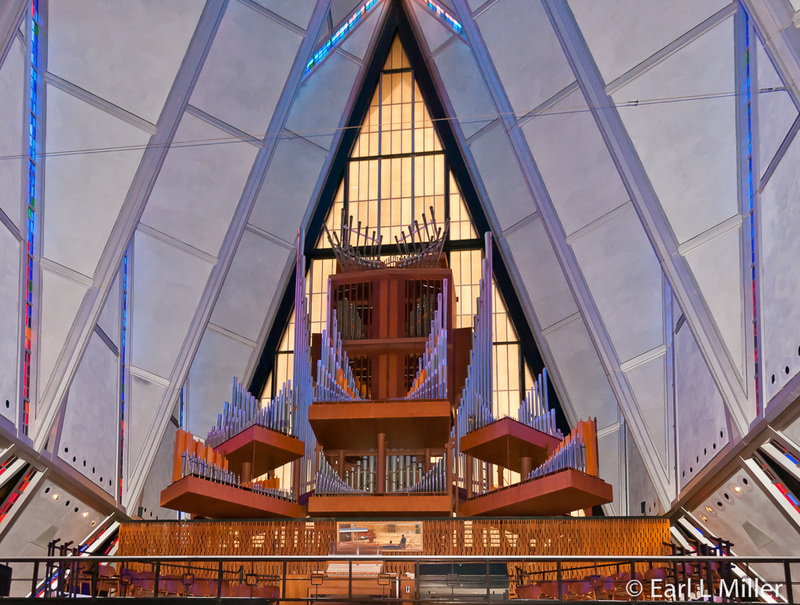 Individuals and organizations furnished everything from furnishings to pipe organs, liturgical fittings, and chapel adornments. Each chapel has interesting features. For example, the ends of each Protestant pew resemble a World War I airplane propeller. A strip of aluminum similar to the leading edge of a fighter aircraft wing caps the pews backs. Cardinal Spellman gifted the altar, in front of the reredos of the Catholic Chapel. The figures of the Stations of the Cross are done in Carrera marble, from the same quarries where Michelangelo obtained his stone. The surrounding foyer of the Jewish Chapel is paved with 1,631 pieces of Jerusalem brownstone donated by the Israeli Defense Forces. In the foyer, in a display case, is a Torah discovered by Poland in 1989 in an abandoned warehouse. It was saved from the Nazis during World War II. This chapel is the only one with individual chairs. In the Buddhism Chapel, you’ll find mats instead of chairs. The Buddha figure on the altar is Burmese, and the large lion-topped censer is from China. The chapel is open from 9:00 a.m. to 5:00 p.m. Visitors may attend Sunday services. The Fort Carson Museum relates the story of the 4th Infantry Division from World War I through Operation Freedom in Iraq. It combines fascinating artifacts inside with a collection of Army armored vehicles, a AH1 Cobra Attack helicopter, and a M115, 203mm (8 inch) Howitzer outside. Funded by Congress, the museum has plans to expand. The 4th Infantry Division was organized at Camp Greene, North Carolina in 1917. They served during World War I in France including the St. Mihiel Offensive and the Meuse-Argonne Campaigns. After World War I, they did occupation duty in Germany. Known originally as Camp Carson, the base’s purpose, between June 1940 to late 1943, was the training of 105,000 troops. During World War II, they were the first unit to land on Utah Beach during D-Day. Later that year, the Division became involved with battles in France. They were the first of the Allies to reach Paris arriving August 24, 1944, but they decided to wait for the Free French Forces to enter first to “liberate” their city. They then went on to Germany after a brief time in Paris. In Germany, they became involved with the Hurtgen Forest Campaign and Battle of the Bulge. The base was renamed Fort Carson in 1954. The Division also served in Viet Nam for a term of 4-1/2 years. They were active in that country’s Central Highlands, Dak To, and the Tet Offensive. From 1971 until December 1995, they were assigned to Fort Carson, Colorado. In January 1995, they were relocated to Fort Hood,Texas with only the 3rd Brigade remaining at Fort Carson. Since the early 1990's, they have been deployed to Somalia; Guantanamo, Cuba; and Kuwait. In addition, they were the military group who did research and development with academics in regards to starting the Internet. They also served as part of Operation Iraqi Freedom in 2003. They were further deployed to Iraq in 2005 and 2007 and were part of the group that found Saddam Hussein during Operation Red Dawn in conjunction with the 1st Brigade Division and Army Special Forces. In 2009, the brigade returned to Fort Carson. Now they serve as security patrols to fight fires and floods. The base was also home to prisoners of war during World War II. Originally, 368 Italians lived at Fort Carson, but later they were withdrawn and replaced by 15,000 Germans within 18 months. They had a Polka hall and produced plays. When a major fire from the Broadmoor Hotel in 1943 destroyed 21 P.O.W. buildings, the Germans were given lumber to rebuild these structures. They also worked on farms and in the laundry. When the prisoners were released, they were sent to Ireland, England, Scotland, and Wales. The Brigade had dog training and mules to 1957. In 1957, the mules were sent to different organizations such as the Shriners Ranch for Mules, two to three miles north of Fort Carson. One famous mule was Hambone (Hamilton T. Bone), with a silvery white coat, who served at Fort Carson with the 611th Field Artillery from 1942-1956. He was purchased in St. Joseph, Missouri as a pack mule and had two combat tours overseas in Germany. He also made three movies in Hollywood. In 1946, at Fort Riley, he won the jumping contest against horses but was disqualified because he was a mule. He died in 1971 and is the only animal with a headstone at Fort Carson. 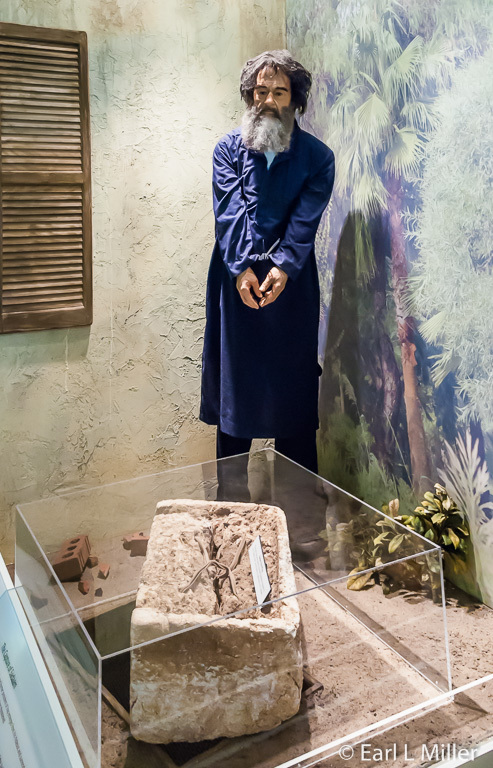 Check out the exhibit on the complete story of his life when you visit the museum. Other displays consist of fascinating artifacts. They have steel from the ruins of the World Trade Center. In the Iraq section, note Saddam Hussein’s pistol and the plug to the spider hole where they found him December 13, 2003. They have a drapery from the palace and a sniper rifle given to him by his son, Uday. Another case is filled with items from D-Day. It contains original newspapers, sand from Utah Beach, a 1941 helmet, model of a Higgins boat, and more. Some cases are devoted to World War II ; another, to World War II German memorabilia. Take time to watch the video on the 4th Brigade and note a 1943 Jeep used in Europe. Just outside the building you’ll find an M182 half track vehicle and a World War II armored car. 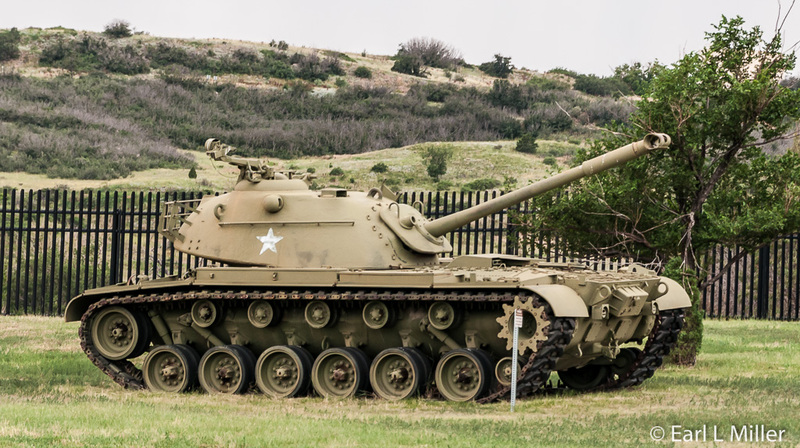 Then head for the field where you’ll spot six different tanks including the M-1 Abrams Tank, M-024 Chaffee Light Tank, and the M-60A3 Main Battle Tank. The Walker Bulldog Tank was built by Detroit Arsenal in the late 1940's. It wasn’t a tank but a reconnaissance vehicle. It was built too late for Korea and too early for Viet Nam. The M-48 Patton Tank was first delivered in 1952 in a multi-contract deal with Chrysler, Ford Motors, and Fisher Body. It was an outgrowth of the Pershing series of tanks. It carried a turret and three secondary guns. 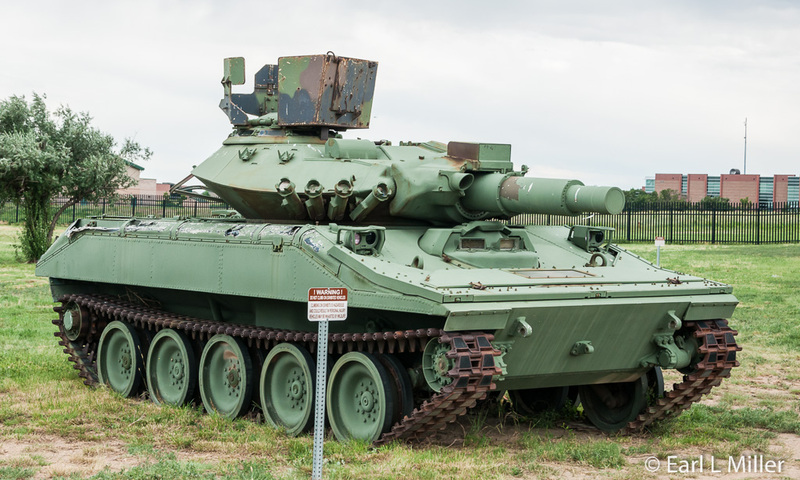 The N0551 Sheridan Tank was first built by the Allison Division of General Motors in 1966. It was a light reconnaissance tank with amphibious and airborne assault capabilities. It could fire conventional ammunition or anti-tank missiles. It saw action in Viet Nam and Desert Storm. 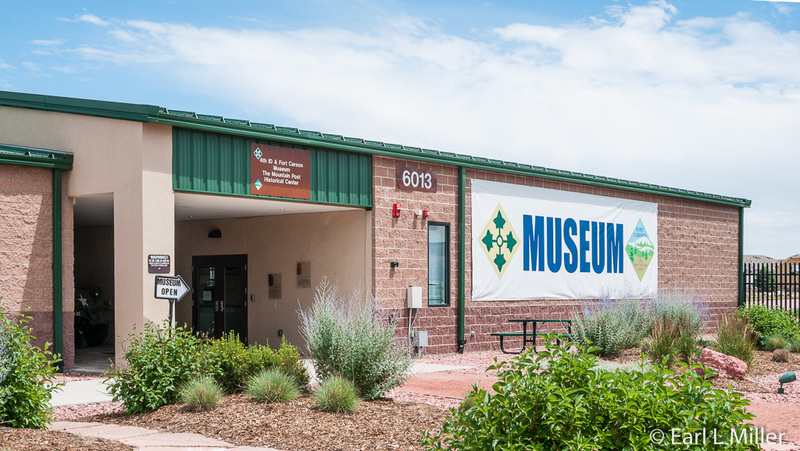 The Fort Carson Museum is located at Building 5012, just outside of Gate One of the base on Nelson Avenue. Hours are Monday to Friday 10:00 a.m. to 4:00 p.m. Their phone number is (719) 524-0915. Admission is free. Peterson Air Force Base was founded in April 1942 as an air support field for Fort Carson and to serve as a photo reconnaissance operational training facility. It was called Colorado Springs Army Air Base. In August, lst Lieutenant Edward J. Peterson was the first Coloradan killed in a flying accident at the airfield. The base was renamed in his honor that December. During World War II, it served first as a heavy bomber combat training center then later changed to fighter pilot training. The base went through a period of activations and inactivations. It’s currently home to the 21st Space Wing, Air Force Space Command, U.S. Northern Command, and the Army Space Command. NORAD moved its operations to Peterson in 2006 with the former facility in Cheyenne Mountain serving as backup. What I found interesting is that the museum’s buildings were at their sites before Peterson became an air force base. The terminal is the entry point to the museum. Built in 1941, with many Art Deco features, it served as the first passenger airport terminal of Colorado Springs. It’s the home of the museum’s store and 8-minute film providing a museum overview. In addition, it houses exhibits on Colorado Springs early aviation, Lieutenant Peterson, and a variety of World War II uniforms. The Old City Hangar housing exhibits dates to 1928. Looking to your right, as you exit the terminal, you will see the Broadmoor Hangar. That’s the place from which Spencer Penrose brought his guests to his hotel. The Spanish home, near the museum, was the airport manager’s residence. Done in Spanish Revival style it dates to 1929. It also served as the airport’s ticket office, passenger area, and overnight sleeping quarters. It’s now used for visitor’s housing. These three buildings and the terminal are on the National Register of Historic Places. In 1930, Western Air Express was the first commercial airline to land at the airport. Continental later purchased this airline. 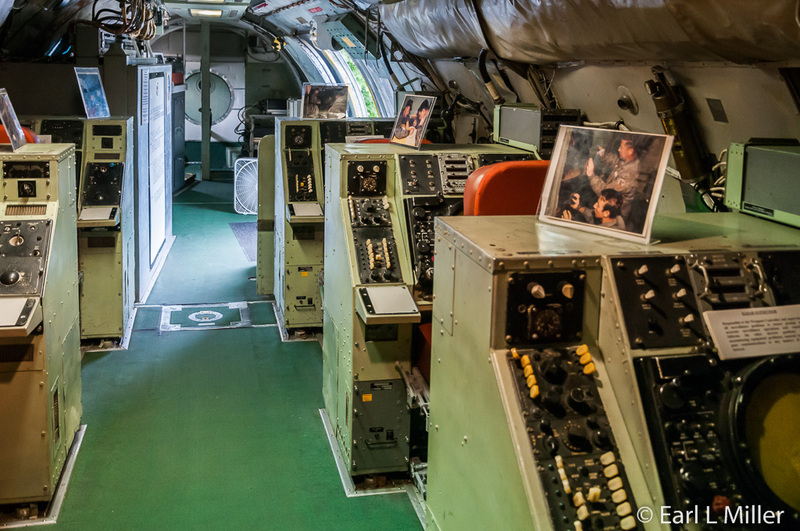 When you leave the terminal, a guide will take you through the large Old City Hangar that is dominated by displays on the defense of North America from the Cold War through 1989. 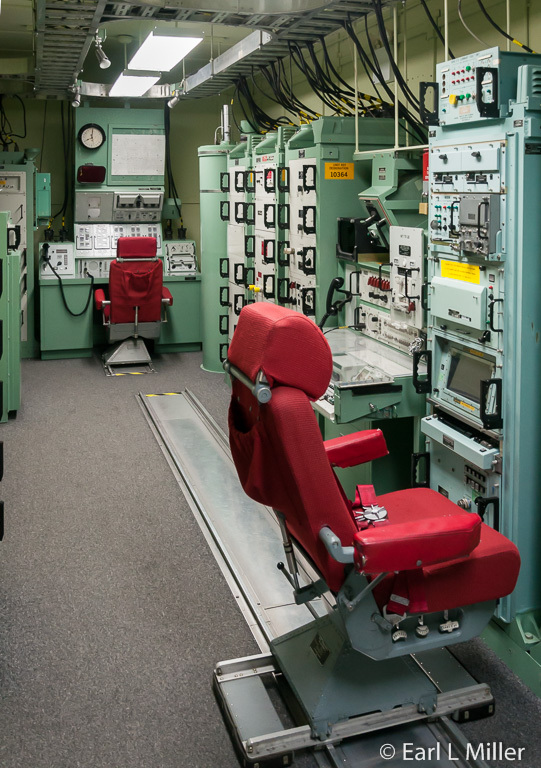 An ICBM exhibit features a Peacekeeper re-entry vehicle shroud and an underground launch control center simulator. It also has early generation satellites, model of the Cheyenne Mountain Operations Center, and radar displays. You’ll see dioramas of the Iceland Radar stations and the Texas Tower Radars. The F-57N Thunderbolt easily grabs attention. It’s a transitional fighter-interceptor aircraft. The museum’s airpark provides a visual of aircraft used in the air defense of North America. It starts with a 1950s era F-86L Sabre and goes to the F-4C Phantom used in Vietnam. These were both fighter interceptors whose responsibility was to identify, scare off, or shoot down enemy aircraft - particularly the Soviet bombers. You can see the Lockheed T-33A Shooting Star which served from 1948 to 1987. Peterson maintained a squadron of these in the 1960's and 1970's. It was a jet pilot trainer. In the middle of the airpark, you’ll see the EC-121T Warning Star. It was a flying radar ship that tracked friendly and enemy aircraft while directing our fight interceptors to intercept. Entering service in 1953, this flying patrol on U.S. coasts served as an aerial expansion of the DEW Line (distant early warning line.) It also guided rescue aircraft to downed pilots and directed U.S. aircraft to aerial refueling tanks. This one came from Homestead Air Force Base. It is the one plane in the museum where you can enter and view its interior. Besides these, you will see surface-to-air missiles such as the BOMARC, Nike Hercules, Nike Ajax and Hawk. Two Canadian aircraft are also present: CF-100 Canuck and CF-101 Voodoo. These were fighter-interceptors and electronic warfare aircraft. To visit Peterson’s Air and Space Museum, it is mandatory to obtain admittance to the base. You do this by calling a minimum of 24 hours in advance of your visit to arrange for a pass and detailed instructions. Everyone must show a valid government issued photo ID, automobile registration, and license tag number. Call the Volunteer Office at 719-556-4915. Use the West Gate to enter the base. Hours are 9:00 a.m. to 4:00 p.m. Tuesday through Saturday. Admission is free. Lieutenant General Michelle D. Johnson is Superintendent of the U.S. Air Force Academy. She is the first woman to serve in that role.